This book guides you to bring out your inner athlete. It is comprised of principles and sequences to improve sport performance. It lays out techniques to better understand how to apply yoga for the athlete including breath, core, posture and balance. With athlete training techniques and movement analysis, we can be more purposeful with our poses. Bring the strength and breathing power of yoga to the sports you love—and seriously up your game! “Your body can either help you achieve your goals or get in the way of you living your best life. By practicing yoga and meditation your body will work with you not against you.” -- Beth Shaw Whether you’re a professional athlete, a weekend warrior or a pick-up game enthusiast, yoga can dramatically impact your athletic performance, improve your alignment, balance, core stability, strength, flexibility, agility, endurance, lung capacity and mobility. 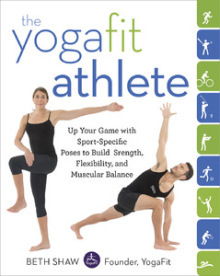 In this motivating and practical guide, celebrated fitness expert Beth Shaw provides short sport-specific yoga routines designed to help counter tight muscles, overuse injuries, and musculature imbalances. By adding a short yoga routine to any workout, you will increase your overall strength and health, and achieve your personal best. Yoga routines designed specifically for swimming, running, cycling, golf, tennis, baseball, football, volleyball, basketball, skiing, snowboarding, weightlifting, kickboxing, boxing, Crossfit and more!